Electric can openers are the ultimate appliance to simplify your life in the kitchen. The best electric can openers on the market are designed to effectively get the job done and lessen any hassle. 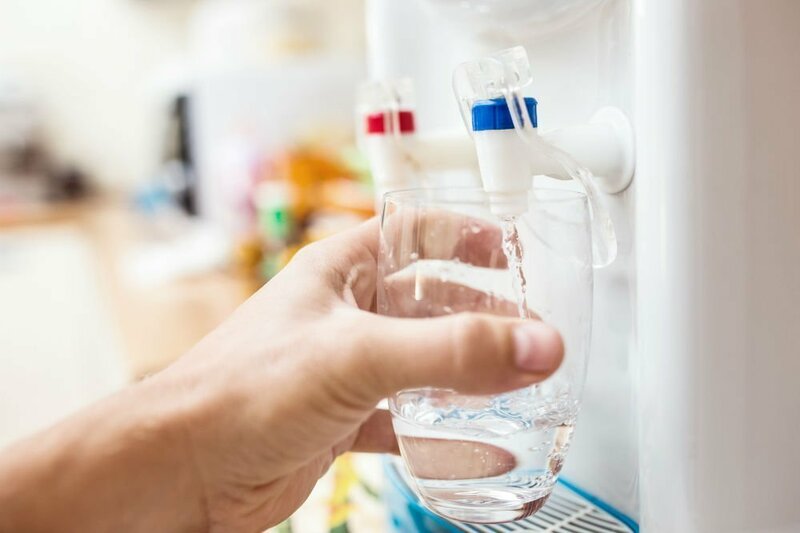 These clever inventions take the strain and hassle out of what can be a very difficult task for some. While manual can openers may seem convenient in their size or simple design, any can opener review will tell you that they just don’t meet the same standard as an electric model that does the hard work for you. Many people don’t have the strength or ability in their hands to use a manual opener, and this is why the best models out there can easily take this tough task away. After doing our research, here is our list of the 4 best models out there. 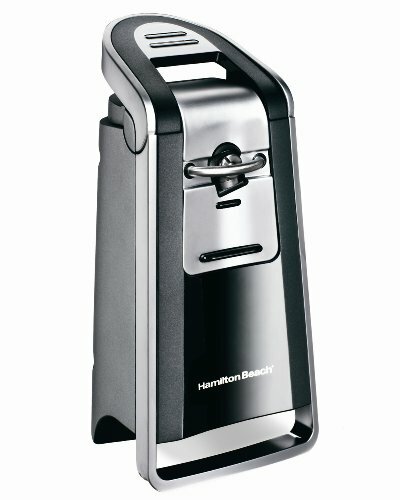 Anyone who owns the Hamilton Beach 76607 smooth touch can opener will immediately give their kitchen a sophisticated and modern look. This can opener is first in mind when it comes to the best electric can openers simply due to its sleek black and chrome design. 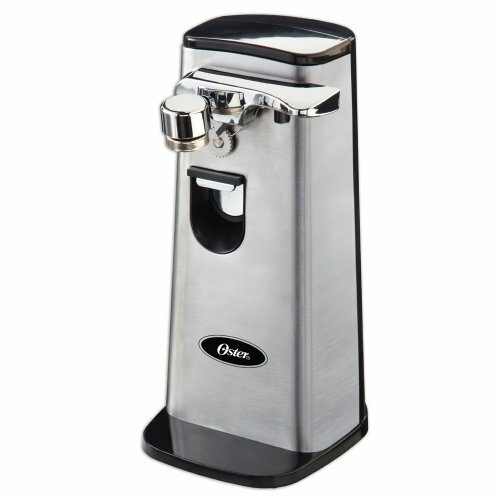 The Smooth Touch Can Opener will open any can with absolute ease and precision. Whether it is of a standard size or with a pop-top lid, this appliance will get it done. A great feature of this can opener is the clever side-cutting system that ensures all cans that are opened have a smooth edge. The Hamilton Beach also comes equipped with a handy set of stainless steel scissors which can be placed in the storage slot included on the device. This sleek, sophisticated, and precise can opener is definitely one of our top picks for the best out there and a must-have appliance. If the rave reviews of this product are anything to go by, the Hamilton Beach 76607 definitely classifies as one of the best out there. Customers love the fact that this particular can opener never seems to get dirty like others, due to its well-positioned blades. People also love the fact that this can opener has such a long cord that can still be easily stored inside the unit itself. Needless to say, customers love the can opening quality and look and feel of this machine. It is definitely one of the best according to the people who own one. 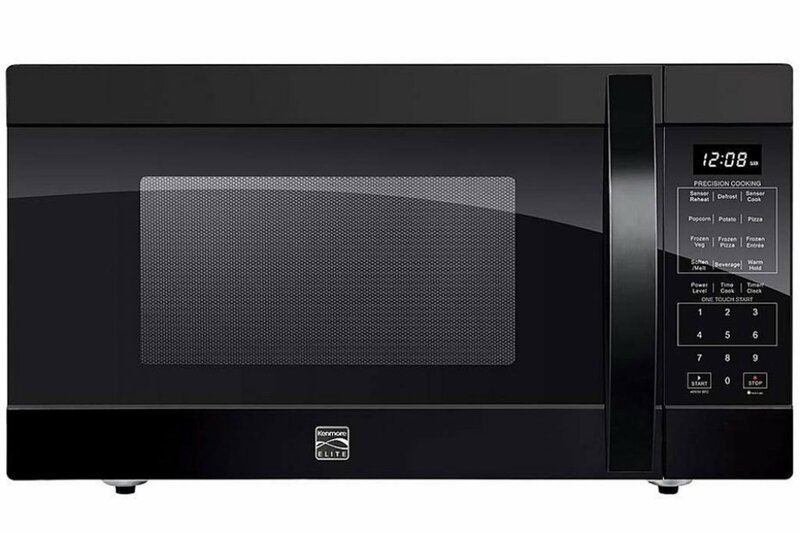 Another best on the market, the Cuisinart CCO-50BKN Deluxe offers great features within a quality appliance. The first great thing about this electric can opener is the easy to use press-and-release lever. This lever allows for the easy opening of any standard size can with minimum effort. 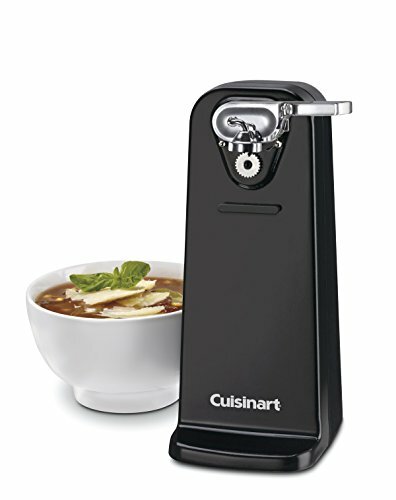 If using a manual can opener can get too strenuous, this Cuisinart product takes that right away with their easy to open functions. The lid of the can is then held tight due to the product’s magnetic lid fastener. This clever contraption then lifts the lid quickly off with a removable activation lever. Additionally, the magnetic lid fastener also makes the appliance easy to clean as it does not come into contact with the food inside the can. 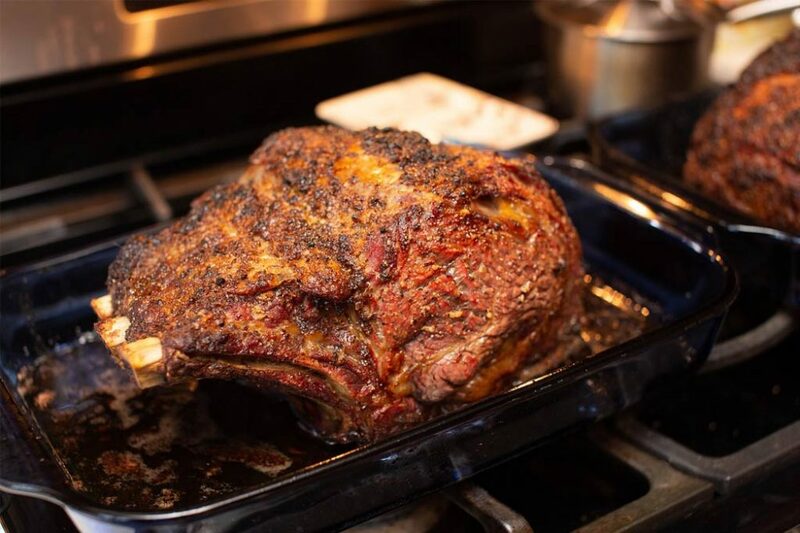 This feature really puts this Cuisinart accessory into our list. Another reason that the Cuisinart CCO-50BKN is one of the best electric can openers out there is due to its sturdy wide base. If you have ever had problems with your appliance sliding or tipping, then this product will be the answer. The sturdy base adds a solid support structure to this machine. Of course, this product is easy to use, quick to open and has a great lifespan making it worthy of being labeled as one of the best. This product has great customer feedback time after time. 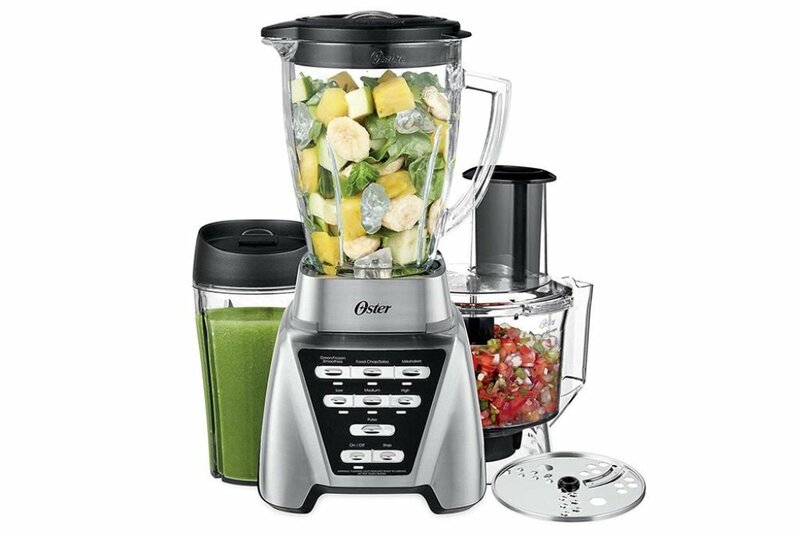 People love this Cuisinart product for how easy it is to operate, as well as its very reasonable price. Customers also love the handy lever function, and the effortless opening ability. The Oster FPSTCN1300 is definitely one of the best you could find. This modern appliance will simplify anyone’s life with absolute ease. This Oster product is made of stainless steel, something which makes it both highly practical as well as stylish. The smooth lines and clean design will fit seamlessly into any kitchen. This amazing product has some great features which help to set it apart. These include things such as a built-in bottle opener and a magnetic lid lifter. This Oster appliance comes with a very smart hands-free operation system. This is achieved through a well thought out power-pierce cutting mechanism, combined with the magnetic lid lifter. This means less contact with the can and any potential germs. This also means that the job will become so much easier to do, as well as easier to clean up. As one of the best electric can openers on the market, it is no doubt that customers have a lot of good things to say about using this product. People love the built-in bottle opener, easy to clean removable pieces, and the solid weight of the appliance. The stainless steel body is a big plus too. The elegant white form of this beautifully designed product combines simplicity with high performance while including some very useful features. 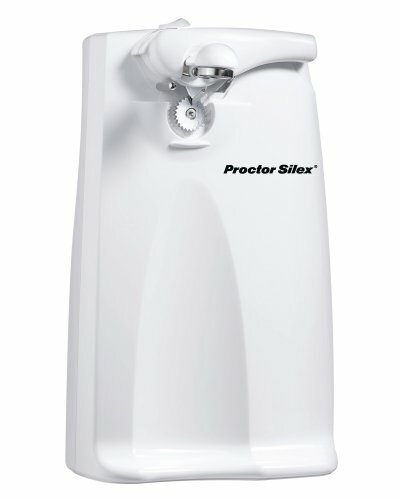 The Proctor Silex Plus is an extra tall appliance that always opens cans on the first go. This machine is very efficient and powerful, as well as being easy to use. A simple attachment and button make this a very handy device for those without a lot of technical knowledge. This could not be considered one of the best if it did not do more than just open cans. This product also includes a useful knife sharpener, as well as a detachable cutting lever, which makes cleaning up a breeze. This is a great all-round appliance to simplify your life in the kitchen. This machine is easy to use and will look great in your home – what more could you want from a top quality appliance. 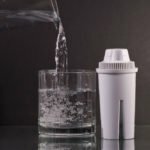 People love the fact that this product can open cans of multiple shapes and sizes with ease. They also love how easy the can opener is to use, and how well it lasts over time. 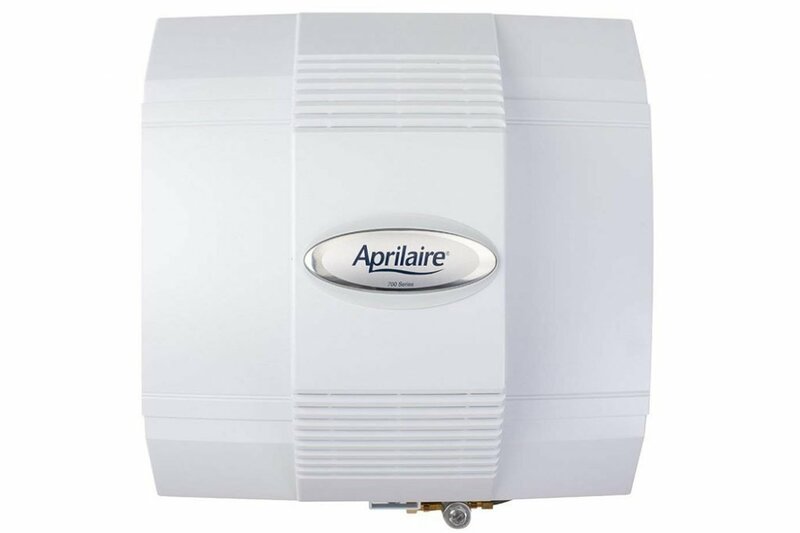 The simplicity, the strength and the great look for such an affordable appliance comes highly rated and is why it can also be classified as one of the top rated models. 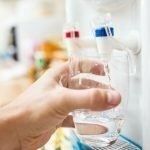 Electric can openers are made to make your life easier, and it is important to know what to look out for in order to make this a reality. The best electric can openers are strong and sturdy in order to support themselves while opening a can. Weight, height, and size are all important factors. An important feature to look for in these products is whether it is able to open a variety of different sized cans. You definitely want an electric can opener that will have you covered for any can. The best can opener for you needs to go together with the style of your other appliances in your kitchen. Make sure that the cord can be neatly stored, and that the appliance suits your space.